The Summerland Stone Circle (see link below) was on the property Kozen and I used to own in Tucson. This Nemeton was used by the Sonoran Sunrise Grove from Imbolc, 2002 through Imbolc 2007, when they moved to temporary quarters to allow us to magically release the land so that it could be sold. When the property sold, the Circle went with it. The altars have been taken down, and it has not been used ritually since the Grove left. Doing this left a hole in my heart, but it's all for the best. The Grove needed to have its own home, and Kozen and I wanted to use the proceeds from the sale of Summerlands to build a joint monastery elsewhere. 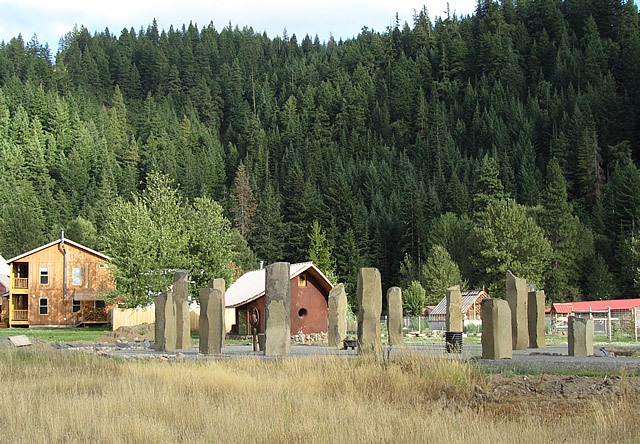 The Monastery in Trout Lake, WA is building a new Nemeton, including a Stone Circle (above), as in Tucson. It is next to the Sanctuary and is the basis of a new religious complex which will also include altars, temples, and gardens.